The multimillionaire developer has, overnight, become a leading voice of the “birther” movement, members of which doubt that President Barack Obama was born in the United States (and, thus, is unable to produce an authentic U.S. birth certificate). As seen above, he provided the conservative web site with what he purports to be his birth certificate. 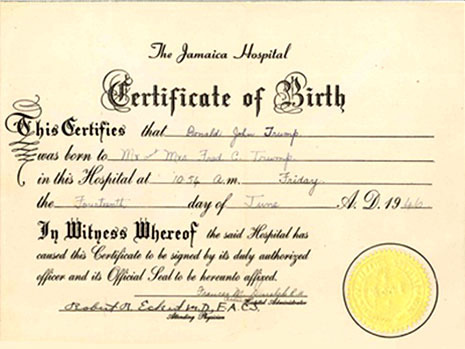 Except the document is not an official New York City birth certificate, but rather a document generated by Jamaica Hospital, where Trump’s mother Mary reportedly gave birth in June 1946. Official birth certificates are issued (and maintained) by the New York City Department of Health and Mental Hygiene’s Office of Vital Records. So, what is Trump trying to conceal? On a possibly related note, Jamaica Hospital has been the recipient of significant financial largesse from the Trump family. In fact, the Queens institution includes the Trump Pavilion, a nursing and rehabilitation facility that was named for Mary Trump. Submitted by canadawesome on Sat, 2011-04-30 18:04. Submitted by Mo Ma' on Wed, 2011-05-04 16:15. Submitted by Donkeydong on Wed, 2011-05-04 12:54. Typical stupid Canadian. Last time I checked you couldn't vote in American election so WTF do you care who we elect? You just worry about your crumbling health-care system. Have you ever thought to ask why the rich from your country come to the US when they need medical treatment? Stooge. Submitted by MissGory on Wed, 2011-05-04 20:16. @Donkey Wow...someone is awfully sheltered now, aren't you? I have Dual citizenship, moron, like MANY you obviously didn't consider, for one. Nobody up here, You know...The country with the more powerful Dollar right now, (and has been for awhile) Second? the reason the 'rich' go down South of the border to get 'medical treatment' is a very simple one: They, unlike most of my fellow Americans CANNOT afford any treatment, so? Why not..and Why complain...Its a good thing, Instead of focusing on being jealous that on this side, there are many things that , and it IS sad, The Sates just cannot offer...and, yeah...Canadians can't vote for 'Presidents'...(WOW! Phew...Thanks for the info..as you must know, Canadians are not aware of this...) I agree...You should be giving a shiat about good ol US of A...instead of showing your envy of a country that is constantly being asked to allow American industries for CDN land, product, oil, power, etc...(How much of China own of the US as of now??) I consider myself very fortunate to be able to call this entire Continent home...So, go get some Crispy Cremes and quit complaining about how it is someone else's fault that you are obese...(and do NOT tell me it's a ***in 'disease') as I believe that is why your vitriol is so vile... I guess that's what happens when you are forced to drink crap beer...(You get the gut...but? Man, it isnt even worth it!) Now Hush...There are fairy tales to be proven as far as the whole Obama/Osama thing is making people like you look like fools. Submitted by Zephid on Sat, 2011-04-30 19:05. Submitted by ronindave on Thu, 2011-04-28 21:17. Submitted by Me1976 on Fri, 2011-04-22 17:15. @James Smith: If Obama was not born in the US (which I do believe he was) he would not be a natural born citizen. Current definition requires BOTH parents be citizen of the US, which his father was not. http://en.wikipedia.org/wiki/Natural_Born_Citizen_Clause#Dictionaries Obama has absolutely not shown his actual, legal birth certificate. Even with the seal on it, what he has produced is the piece of paper you get at the hospital when a baby is born? If you think that is of equal legal weight as a birth certificate, try signing your kids up for school, or anything else that required a birth certificate, and you will be told that is not a birth certificate and you need to get one. Why do you not find it strange that no one in HI can, today, find the birth certificate? I do think he was born in Hawaii. However, I do think he's hiding something. Would you spend over $2million in legal fees to keep your birth certificate from being released, especially is you were running for President? The problem is, if he lied about his family or personal history, what else will he lie about? His entire political career has been built around the narrative he has told about his life. If it's all bullshiat, what does that tell you about the man? Submitted by Mo Ma' on Fri, 2011-04-22 18:48. The Immigration and Nationality Act 101 and subsequent addendum maintains that anyone born in the United States, including Hawaii, "is born in and subject to US citizenship" regardless, even if both parents were illegally in the US at the time of birth. Both parent do not have to be US citizens at bith-why do you think all of these Mexicans are running accross the southern border to have their babies here in the US-because those babies are US citizens and perhap one day, they will be able to petition for their parents to legally reside in the US. Birthers are not well versed in Federal Statutes governing US citizenship-it's just smoke and mirror for the gullible and foolish....if you don't like him because of his color of his skin, just say so, at least be honest and stop the hypocrasy. Submitted by ONEMLW11 on Thu, 2011-04-28 03:16. It is you who does not understand... the "anchor" babies of which you speak are U.S. citizens but NOT "natural born" U.S. citizens... they could NEVER run for POTUS nor VP... any other office is ok! You need to study more before giving your next lesson on U.S. Constitutional eligibility for POTUS and VP! Submitted by Alcam on Sat, 2011-04-30 11:06. Perhaps you should go read the case law quoted on that wikipedia page in which on a number of occasions the courts have ruled that if you are born in the US then you are a natural born citizen(http://en.wikipedia.org/wiki/Natural_Born_Citizen_Clause#Supreme_Court_c...). This is because contrary to what the first person thinks there is no definition provided for what a "natural born" citizen is. As a result it is defined by common law which gives us the born in US = natural born citizen. Ironically the first person's link was to the definitions which doesn't prove his point at all, quite the opposite in fact.